Casually arcing above the Sun (from right to left in these SOHO LASCO views) this week, comet SOHO-884 was first seen by SOHO on Dec. 16, 2004. For the first couple of days in the video clip the comet's tail is clearly discernible, but then due to our viewing angle it seems to fade. The comet was first spotted in four images taken by SOHO's ultraviolet, interstellar medium-viewing SWAN instrument by Michael Mattiazzo, but he was not certain about it. On Dec. 16th, a bright comet entered C3 and was first reported by John Sachs. Shortly after, Sebastian Hoenig pointed out that this comet had the very real possibility of being Michael's SWAN comet, a connection that was soon confirmed. So many hands were involved in making the discovery. The comet is not a member of any known group of comets, but instead one that does not appear on a regular schedule as some do. 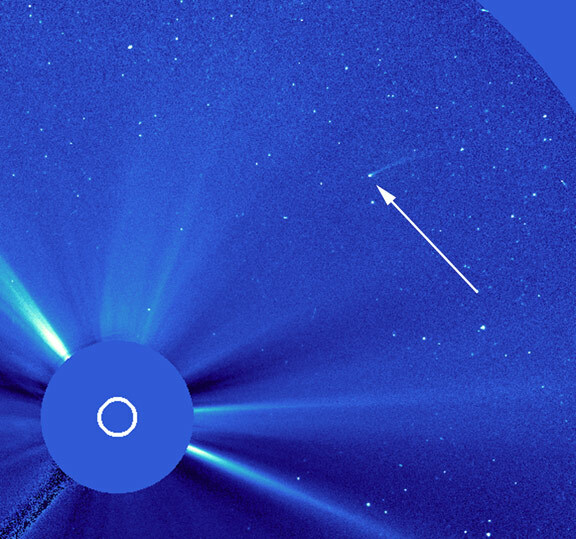 SOHO has now discovered over 160 comets this year alone and as can be seen in the name "SOHO-884", this is the 884th comet discovered by SOHO since its launch in December, 1995. Comets are frozen balls of ice and dust that are believed to have been created when the universe was very young. In fact, scheduled for July 2005, NASA's Deep Impact's spacecraft will arrive at Comet Tempel 1 and become the first mission to impact the surface of a comet. You can learn about this mission at http://deepimpact.jpl.nasa.gov/. SOHO began its Weekly Pick some time after sending a weekly image or video clip to the American Museum of Natural History (Rose Center) in New York City. There, the SOHO Weekly Pick is displayed with some annotations on a large plasma display. If your institution would also like to receive the same Weekly Pick from us for display (usually in Photoshop or QuickTime format), please send your inquiry to steele.hill@gsfc.nasa.gov.